A question every home buyer has come across while house hunting is whether to buy a Ready-to-move home or one which is under construction. Without expert guidance, it becomes difficult to figure out which property shall serve one’s and his/her family’s needs, in addition to the property turning into a steady return on his/her’s lifetime investment. While an under construction home might seem to be a feasible option, it is ready to move home that turns out to be an ideal option for immediate results. 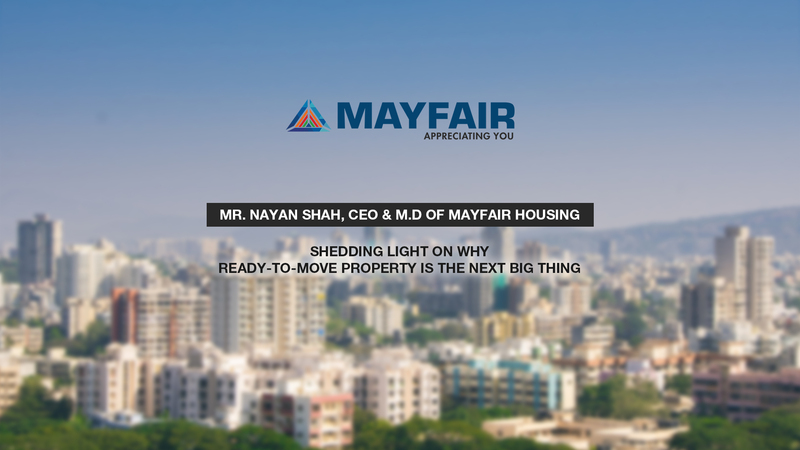 Nayan Shah, CEO & MD, Mayfair Housing Pvt. Ltd. tells you why and what makes buying a ready home a wise decision. According to him, the most important task you need to tick off the list while buying a home is to check whether it is OC ready. According to him, ready homes allow transparency and better pricing along with the satisfaction a person experiences when he immediately receives the possession of his/her new home. Mayfair Housing offer home buyers with RTM homes that are OC approved, MahaRERA registered and affordable, thus you can buy a home only after being completely assured about it.